Recently I got to know N through a friend on Facebook. 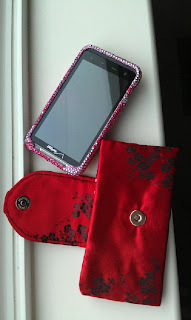 N knows that I sew and had wanted me to custom make a pouch to fit her cellphone. She gave me her cellphone dimensions and picked out her fabric. And this was what I had come up with based on what she had said she wanted. 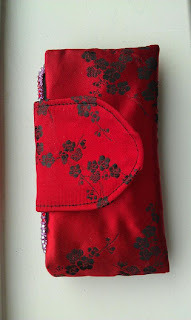 As it was the first time I was making a cellphone pouch....it took me numerous attempts before getting it right. Also, it didn't help that the brocade fabric was super difficult to handle as it frays like crazy and puckers easily too. Anyhow, I finally managed to make something decent looking and mailed it to N who lives on the west coast. I'm just glad N likes it. The photos are courtesy of N as I had forgotten to do so in the rush to get the pouch out to N. Don't you just love her bling-bling phone?! Beautiful. I love the oriental brocade material. Red is a good colour too.